Can Invasive Species Trigger Black Swan Events in Nature? I’m looking forward to the upcoming Fall 2012 series of Hot Science – Cool Talks. During the first presentation, Black Swans & the U.S. Future: Creating Sustainable & Resilient Societies, Dr. David W. Orr will talk about how sudden and unpredictable events drive change in human and natural systems. I’m especially interested to learn if the introductions of invasive species to an ecosystem may represent black swan events in nature. I remember watching a rerun of the PBS Nova episode, Deep Sea Invasion, which showed how a bright green seaweed (Caulerpa taxifolia) that was used to decorate salt water aquariums escaped into the Mediterranean sea and created a choking monoculture wherever it went. The dense carpet of seaweed represented a great change in the ecosystem since it overwhelmed native species and deprived native marine animals of food since the seaweed has a toxin that the creatures cannot eat. In 2000, scientists found this invasive seaweed growing in the waters outside of San Diego, California, probably accidentally released by an aquarium owner, but due to early detection and rapid response, scientists were able to contain this killer alga with plastic and eradicate it with chlorine. Like the Wakame (Undaria pinnatifida) seaweed shown in First wave of tsunami debris brings dock loaded with invasive species to the US West Coast, Caulerpa taxifolia is also in the Global Invasive Species database lists as one of the world’s 100 worst invasive species. 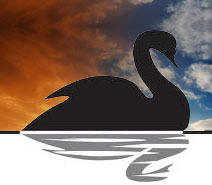 I can’t wait to attend the next Hot Science – Cool Talks and learn more about black swan events from Dr. Orr and the Environmental Science Institute at UT Austin.